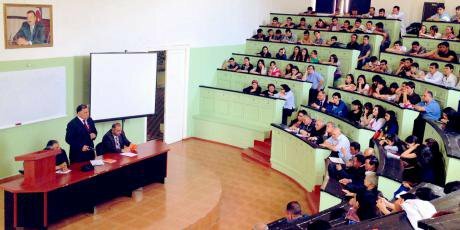 Students attend a lecture at Azerbaijan Medical University in Baku. Photo CC: Mohammed Sadegmo / ATU-AMU / Flickr. Some rights reserved. Azerbaijan is losing its educated young people. I know from personal experience; my late father, an academic, insisted on sending me to study abroad. He encouraged my application to universities in Turkey and shortly after I left to study International Relations in Ankara, my dad gathered his documents and in a sign of protest left our native Azerbaijan to teach in Turkey as well. He was frustrated with corruption and the falling quality of education – and when the former minister of education openly forced him into taking bribes. That’s just how things worked, but he decided he’d had enough. Threats from the ministry that he would lose his position as university rector, were the final straw. He resigned and transferred himself to Suleyman Demirel University in Isparta, Turkey, where he continued teaching economics and civil engineering until his death in 2012. “Connections” and “gifts” didn’t have the same weight there. My father graduated high school in his small village with a gold medal, aced university and went on to pursue his graduate studies in Moscow. His was a Soviet education. By the time I was halfway through primary school, Azerbaijan became an independent state, and we watched how quickly my teachers of Russian and Jewish descent were replaced by Azerbaijani teachers who barely knew neither Russian nor the subject they were supposed to teach. In 6th grade, I was transferred to a Turkish lyceum from where I went to pursue my studies in Turkey and the United Kingdom. When entrenched corruption and nepotism are business as usual, does hard work and hard study count for anything? Things weren’t ideal, but I didn’t experience corruption, and my teachers seemed more driven by teaching classes than taking bribes. But I always considered myself among the lucky ones, certainly compared to my friend Aynur Jafar. Despite being accepted to the prestigious Baku State University to study law, her hopes were quickly crushed. Students were often humiliated by their professors and corruption was rampant. Aynur realised that the next six years she would spend there were a waste of time. Aynur recalls how some of the professors teaching at the law faculty even threatened students with raising the final price for passing exams unless their students started behaving in class. Jafar and a handful of other students refused to pay bribes for grades. The average price tag for an “A” was around $300 while Jafar was an undergraduate student between 2000 and 2004. Azerbaijan is undergoing a protracted economic crisis, which its authoritarian Aliyev regime is having difficulty tackling. When entrenched cronyism, corruption and nepotism are business as usual, does hard work and hard study count for anything? Under these circumstances, many citizens would happily seek a better life elsewhere, and the educated ones are no exception. The journalist Emin Milli was 26 when he came up with the “Gelecek Ozu Gelmeyecek” [Azerbaijani: The future won’t come by itself] campaign, calling on universities in Baku to send 5,000 Azerbaijani students every year to study abroad. That was in 2005. A year later, President Ilham Aliyev signed a presidential decree on an overseas scholarship programme for 5,000 students. It would be funded through Azerbaijan’s State Oil Fund (SOFAZ) and managed by the ministry of education together with State Committee for Student Exams. Unlike Milli’s proposal, the government programme planned to spread the 5,000 scholarships over several years. The same year also saw a scholarship programme launched by SOCAR, the state oil giant, which offered financial support for students interested in engineering, human resources or law. SOCAR aimed at sending 50 students a year, but last year sent 100. Of course, there were strings attached – students had to agree to come back home and spend five years working in Azerbaijan after graduation. 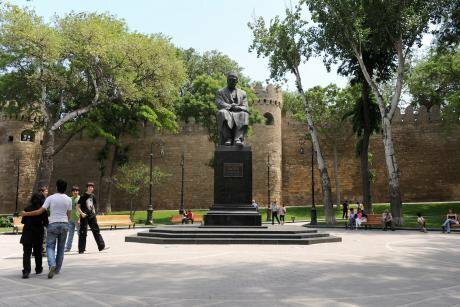 Young people take a stroll by the statue of poet Mirza Sabir near the old city walls in Baku, Azerbaijan. Photo (c): Anthony Devlin/PA Archive/PA Images. All rights reserved. While the government had taken up Emin’s proposal, it was just about the only idea which pleased the authorities. In 2009, Milli was arrested with his friend Adnan Hajizade and sentenced to two and a half years’ imprisonment on bogus charges of hooliganism. Milli, who went on to found the independent outlet MeydanTV in 2013, was already known for his critical views of the Azerbaijani government, while Hajizade was founder of a popular youth network called OL! [Azeri: “to be”]. Though they didn’t receive government scholarships, Emin and Adnan were both Western-educated and the traction the two young men were accumulating through their youth networks scared the authorities. In the aftermath of the rigged 2008 presidential elections and referendum in 2009, it became clear that dissent was not to be tolerated. So high was the fear of the authorities’ fear of social-media fuelled unrest, given what was happening in neighboring Iran, and later during the Arab Spring, that the state scholarship program changed its priorities. Out went economics, law and political science; the focus was now on physics, chemistry and anthropology. Some of the scholars saw this shift as missing the point behind the idea of sending students abroad in the first place. Whatever subjects they study, rarely do qualified western-educated alumni receive high ranking or decision making positions in Azerbaijan’s government. We may as well ask whether Azerbaijan’s government cares about the problem at all. I’m not convinced that they do; those who leave, whether with a scholarship or not, often don’t want to be associated with the regime. Those who leave for reasons other than education may do so out of a deeper frustration, so the powers that be certainly won’t miss them. Azerbaijan’s State Statistical Office does not keep statistics (at least not public ones) about Azerbaijani emigres and asylum seekers. But it does provide some limited data on foreigners who have moved to Azerbaijan compared to Azerbaijanis who have left the country for good. The most recent data is from 2015, which indicates a number of 2,700 foreigners whomoved to Azerbaijan versus 1,600 Azerbaijanis who have left the country permanently. The UN Refugee Council paints a more drastic picture. As of June 30, 2016 there were 5,959 Azerbaijani citizens with pending asylum applications elsewhere and 11,160 refugees and people in refugee-like status. In 2015 these numbers were 5,230 and 9,712 respectively. Of course, politically-motivated emigration is only a small part of brain drain, and the majority of Azerbaijanis who leave do not request asylum - but even the growth in this category should give us pause. Let’s return to my friend Aynur, a human rights lawyer who’s now based in the USA. She left Azerbaijan in 2014, during that year’s crackdown against prominent civil society activists, journalists and human rights defenders including her former teachers, mentors and colleagues. It became impossible to work as a human rights lawyer, even for international organisations. Authorities introduced draconian amendments to the law on NGOs, and a wave of criminal cases launched against them in April 2014. Work carried out by both international NGOs but also their local partner stalled. The Open Society Foundation, IREX, and NDI were among the international organisations eventually forced out of Azerbaijan. Azerbaijan State Economic University, Baku. Photo CC-by-2.0: Niyaz Bakili / Flickr. Some rights reserved. In a recent interview with Radio Azadliq, the Azerbaijani service of RFE/RL, former political prisoner and veteran journalist Rauf Mirkadirov said that the current waves of migration were wholly predictable. Speaking about political exiles like himself (he’s reunited with his family and is now in Switzerland), Mirkardirov added that sooner or later, everybody wants to live a comfortable life, free from harassment. At least, that explained why his generation are leaving. His concern was that young people are choosing to leave, which does not bode well for Azerbaijan’s future. Kamal [a pseudonym] is just one such example. Unlike Aynur and Rauf, Kamal’s motivation to leave was less political. He had a well paying job, a high-level position at a company, but he couldn’t put up with life in Azerbaijan for much longer. “I’d say that 60% of my decision to leave was to find a better quality of life with better prospects and medical insurance. A justice system which works, and without this stifling atmosphere where everybody is afraid. The inequality is also depressing… I simply could not longer stand seeing the injustice”, he concludes. There are many other Azerbaijanis like Kamal: middle class, educated people in their mid-30s and early 40s who plan to leave or have left already in search for better opportunities for their families and children. For working class families where knowledge of foreign languages or specialist higher education is non-existent, the choice of destination is much narrower. It’s usually Russia, where several hundred thousand (if not millions) of Azerbaijanis already live – as another post-Soviet state, it’s easier to adjust to life there, and many people have family connections. But this in no way means that Russia is only a destination for Azerbaijan’s unskilled workers. After an Azerbaijani member of parliament recently called emigres in Russia the “scum of Azerbaijan,” an outraged social media campaign against him revealed how diverse this community really is. Most Azerbaijanis speak at least rudimentary Russian – but for those who want to move outside the former Soviet Union, the language barrier is a big hurdle. Kamal believes that had Azerbaijanis grown up speaking English as opposed to Russian as their second language, there would certainly be more people seeking a better future in the EU, US, or Canada. The state scholarship program refused to open doors for students like Jafar. Clearly, the ministry of education valued loyalty over capability. She was one of many applicants turned down because of her political views. There were some exceptions, but mostly for the pretence of keeping a balance. In 2013, Mikayil Jabbarov, a charismatic 40-year old, replaced 70-year old Misir Mardanov as Azerbaijan’s minister of education. Mardanov had occupied the position since 1998 (it was he who sacked my father), but his replacement did not change much. Corruption and an outdated teaching style continue to plague Azerbaijan’s education system. 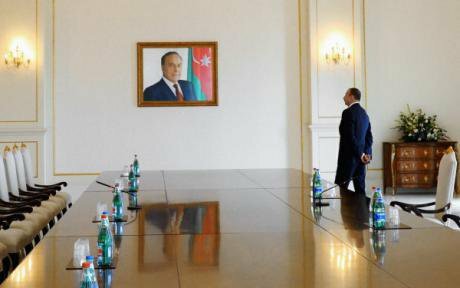 Ilham Aliyev, the current president of Azerbaijan, contemplates a portrait of his father Heydar, the country’s former president and Soviet-era leader. Photo (c): Vladimir Fedorenko / RIA Novosti. All rights reserved. The poor quality and lack of independence of higher education in Azerbaijan is beginning to make it unattractive for the country’s young people. At least, that’s is how Nijat Mammadbayli put it. Nijat, who is currently studying for his master’s degree in Germany, was also turned down by the ministry for his political and social activism and because law, his chosen field of study, was not seen as a priority. In fact, none of the political or social science fields are listed as priority areas today on the website of the State Program for Azerbaijani students to Study Abroad. Instead, the ministry is offering scholarships for students interested in studying in practical and vocational fields. “There’s not much vision. The state still doesn’t have a training blueprint for teachers, its law on education still isn’t fully developed and despite numerous programmes announced since 1999, none have been fully implemented. We’ve only seen cosmetic changes” explains Malahat Murshudlu, head of the Azerbaijan Free Teachers’ Union. After 20 years, even SOCAR has realised that it could have easily afforded to found an entire university itself. As one scholar told me on condition of anonymity, doing so will ensure that it has professional and “reliable” cadres to with with in future. After the rigged referendum last September, some 29 amendments were made to the Azerbaijani constitution, which included extending presidential term limits and creating a vice presidency. In late February, president Ilham Aliyev appointed his wife, Mehriban Aliyeva to the position of first vice president making her the country’s second highest ranking official with full immunity. In case Ilham Aliyev steps down, his wife is now in a position to replace her husband. On 3 March, a court in Baku sentenced the popular video blogger Mehman Hüseynov to two years in prison on charges of slander, in the first open sentencing of a journalist for such a crime. Azerbaijan now has at least 7 bloggers and journalists behind bars while one of the managers of an independent online television channel Kanal 13 was detained on May 2, and sentenced to 30 days of administrative detention. Another regional reporter is facing possible hooliganism charges. Azerbaijan’s old social contract, in which the state promised rising living standards in exchange for citizens staying out of politics, is looking quite brittle. The regime is tightening the screws, and living conditions are proving more challenging than ever before in the aftermath of two currency devaluations. A number of MPs have even suggested that Azerbaijanis literally tighten their belts by eating less and staying in shape. Azerbaijan’s monthly minimum wage is now 155 Manat (approximately £71); in 2016 it was 136 (£63). 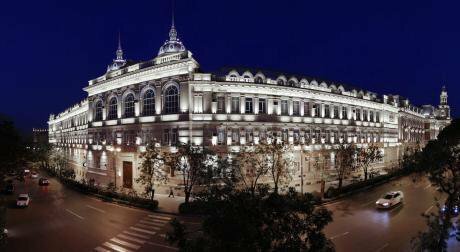 The average monthly salary is now 490 Manat (£223). And while Azerbaijan’s state budget for 2017 has been significantly cut, the government intends to open its doors for yet more expensive international events, such as the Islamic Solidarity Games and Formula 1 Grand Prix. A brain drain, a colony of emigres – call it what you will. The reality is that Azerbaijanis who know about foreign languages and foreign opportunities, who are tired of paying bribes and keeping their mouths shut are leaving in search of a better life. Giving up on one’s country is never an easy feat, but for educated young Azerbaijanis, there are few other options.